It’s the genetic equivalent to discovering a new sensory organ in plants. A team at the University of Missouri Bond Life Sciences Center found a key gene that sniffs out extracellular ATP. Scientists believe this is a vital way plants respond to dangers, such as insects chewing on its leaves. The journal Science published their research Jan. 17. ATP (adenosine triphosphate) is the main energy source inside any cell. All food converts to it before being used in a cell, and ATP is necessary to power many of the cell processes that create more energy. Its value as an energy reserve is squandered outside the cell. Scientists spent years trying to figure out what this compound did while floating outside cell walls. Animal researchers found that answer in the 1990s. They identified the first ATP receptors, now seen to play roles in muscle control, neurotransmission, inflammation and development. Plant scientists observe similar extracellular ATP responses in plant biochemistry, but until now could not identify the exact receptor for it or what it did. 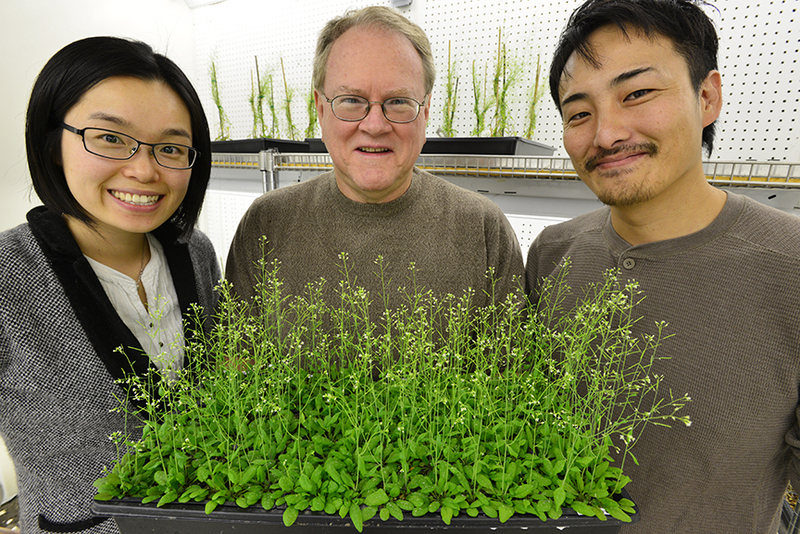 Led by Stacey, MU graduate student Jeongmin Choi and postdoc Kiwamu Tanaka screened 50,000 mutant Arabidopsis plants to find ones that didn’t respond to extracellular ATP. Using a protein called aequorin – which causes jellyfish to glow – the two-year process boiled down to whether a plant would produce light when ATP was added. 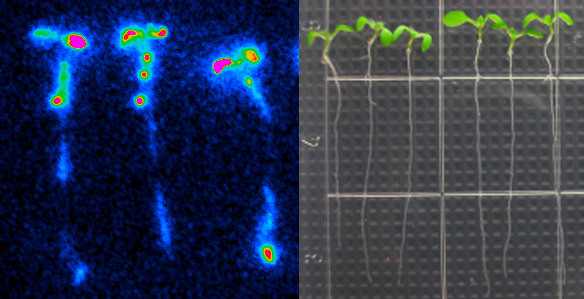 Since aequorin only luminesces when it binds to calcium, those plants without extracellular ATP receptors stayed dark. By comparing the genetic sequences of these nine mutants, Stacey’s lab pinpointed the gene to chromosome 5 and labeled it DORN 1, since it doesn’t respond to the nucleotide ATP. This discovery casts a different light on previous research. Future research will focus on exactly how this receptor works with ATP. Tanaka plans to study its protein structure, how it reacts to pests in lab situations and possible co-receptors that could also play a role in recognizing ATP. Grants from the U.S. Department of Energy Office of Basic Energy Sciences and the Republic of Korea supported this research. You can’t see the resemblance, but cells in Michael Roberts’ lab share a family tree with some newborns. Their common genetics may help explain severe, early-onset preeclampsia, an inherited disorder that leads to a placenta that is often small and inefficient and possibly due to the mother’s body not fully welcoming her pregnancy. 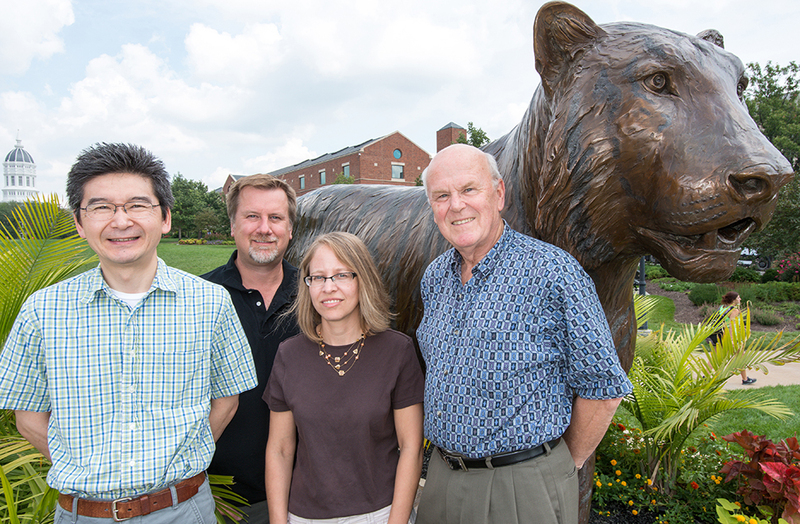 University of Missouri Health Center scientists such as Danny Schust and Laura Schulz, work with Roberts and Toshihiko Ezashi, both Bond Life Sciences Center reproductive biologists, to search for its complex cause. That starts in the delivery room. OBGYN’s Danny Schust and his residents save small pieces of umbilical cord from preeclampsia pregnancies, allowing Roberts and Ezashi to grow cells with the disease. Preeclampsia affects 3-7 percent of births worldwide, and leads to around 50,000 deaths annually. Symptoms like high blood pressure and protein in the urine tip off doctors to the disorder, but it can go unnoticed until late in the pregnancy unless the symptoms are severe. Left unchecked the disease can lead to seizures and death. The only cure for the serious early-onset form of the disease is to deliver the baby prematurely, usually between 28-33 weeks. This leaves the newborn underweight and with complications like underdeveloped lungs. Creating useful cells from the collected umbilical cords takes a little bit of work. Cells grown from the umbilical cords are converted into induced pluripotent stem cells, with potential to become any type of cell in the body. Researchers then use a series of hormones, growth factors and other conditions to create placental cells mirroring the previous pregnancy. Normally the placenta – containing genes from both mother and father – grows into the wall of the uterus to establish a supply of blood, nutrients and oxygen to support the embryo. But in preeclampsia, those cells encounter problems. Roberts and Schulz focus on extravillous trophoblasts, placental cells that invade the wall of the womb, while collaborators Toshihiko Ezashi and Danny Schust study synctiotrophoblasts, placental cells responsible for uptake of oxygen and nutrients from the mother’s blood. The Roberts/Ezashi/Schulz/Schust team still has several years left on two five-year National Institutes of Health grants and hopes to narrow the search for genes linked to preeclampsia. If they pinpoint the culprit genes, scientists could one day potentially correct the problem by developing drugs that restore normality to the placental cells or even by using an induced pluripotent stem cell approach. Michael Roberts is a Curators’ Professor of Animal Science, Biochemistry and Veterinary Pathobiology in the College of Agriculture, Food and Natural Resources (CAFNR) and the College of Veterinary Medicine, respectively. Toshihiko Ezashi is a research associate professor in CAFNR. Danny Schust is an associate professor and Laura Schulz an assistant professorof Obstetrics, Gynecology, & Women’s Health, at MU’s School of Medicine.